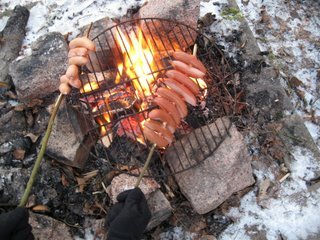 We’ve spent Xmas and New Year with LB’s folks in Sweden and have been very lucky with the weather. It hasn’t quite managed to get above freezing for the whole two weeks. It’s generally not been above -3 or -4 C and even touched -13 C overnight (and looks set to beat that tonight in fact!). And with little snow, we’ve therefore had some excellent tour skating conditions. So we’ve picked up from where we left off last year. Ice is not always skatable apparently. If there’s a layer of snow or if the ice was roughened by being formed during heavy snow fall you can hardly move. Gliding strides simply grind to a halt. 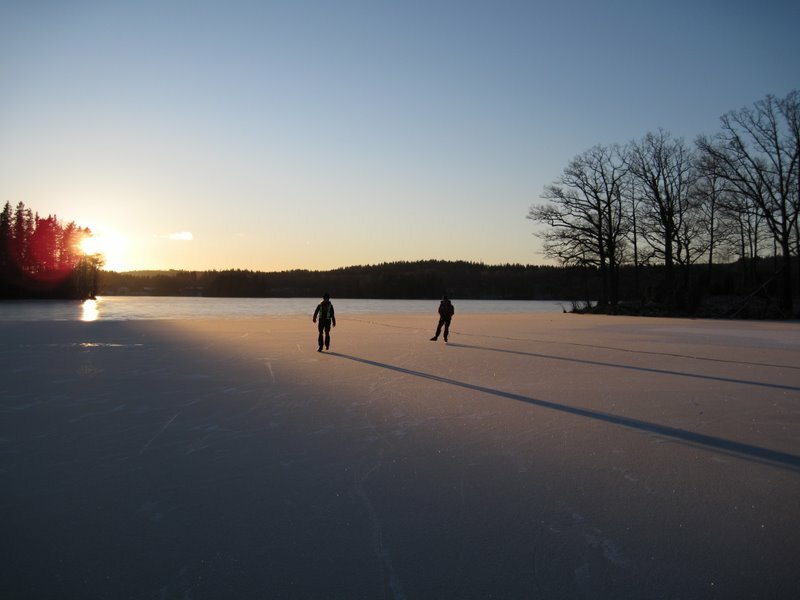 But for us the ice was nearly perfect. With occasional sections of glass-like smoothness allowing us to glide and glide. I’ve even managed to go out four times and only fall over once and that was only a sort of sliding, resigned laying down. And I’ve now bought my very own tour skates. Unlike the ones I used last year, these have only got snow-board style bindings at the toes meaning that they fitted my Montrail Cirrus GTX even more easily (I miss my inov8 terrocs very much already this winter but they’d be little use for this). The huge advantage with having my own skates is that I can set them up so that they are balanced specifically for me. The skate must be right in the centre of the heel and right in between the first and second toes. Each day I’ve come back and spent some time in the garage tweaking the adjustment and it’s helped massively. I imagine that for a better skater it would be less critical but for me it’s made all the difference. Until today when I spent twenty minutes wondering what I could have adjusted so badly… at which point I noticed I’d put them on the wrong feet! Well it is New Year’s Day. I’ve had a late night. The other thing that has made a huge difference is wearing protective pads on knees and elbows along with wrist-protectors. Add in an old riding helmet (a childhood skating rink accident when I landed on my head still haunts me!) and my confidence, and therefore posture, improved enormously. Though I’m not sure it would have avoided over-stretching my shoulder somewhat last year when I tried to punch a hole in the ice with one elbow! I also learnt a few more tidbits of tour skating lore. Like it’s best for the skate to be adjusted to protrude behind your heel for half an inch (1.5cm) or so, or else the skates want to shoot out forwards if you lean too far backwards. And that the skate blade itself is not straight but is in fact a section from a notional circle of around forty metres in diameter. A smaller diameter circle obviously gives a more pronounced curve (if you can call it pronounced when you need a steel-rule before you can see it’s not straight). A more pronounced curve is apparently better for turning quickly whereas a straighter edge is more stable in a straight line. A tiny extra bit of kit is the clips that can be used to hold the skates together to make them easier to carry and prevent the blades being blunted accidentally (my simple blue ones are visible in the picture along with the more elaborate red ones with velcro straps to ensure the skates stay together). Skating clubs (who may do several tens of kilometres in a day) will have a leader who typically skates twenty metres ahead of a second leader with the rest of the group another twenty meters behind them. So if the leader misjudges the ice and “plurrar” (“takes a bath”) then the group has plenty of time to stop. The specialist rucksacks that tour skaters use have a crotch strap so that the bag doesn’t rise up if you have a bath and thereby acts as a float with all your spare clothes in a waterproof bag. They also have a throw-line to be thrown to the swimmer (rather like in kayaking). 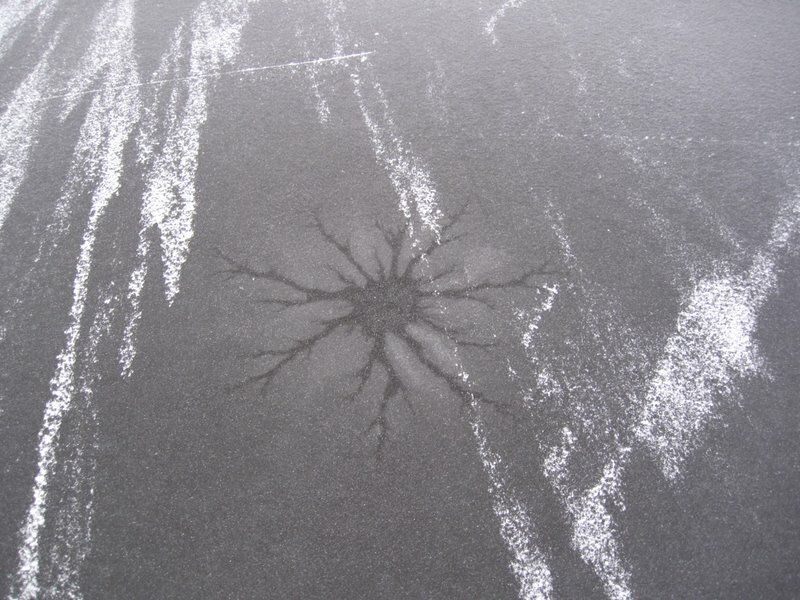 As you skate, you must be wary of weaker patches seen as odd patterns. 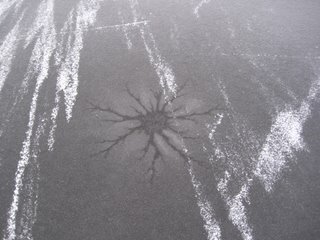 They become safer as the ice thickens. But at the marginal end, when the ice is only just skatable at around six centimeters, then they must be avoided. Finally, once off the ice, a nip of something very alcoholic from a hip flask that’s been chilling in the day-pack along with some Prinskorv heated over a fire is hard to beat. 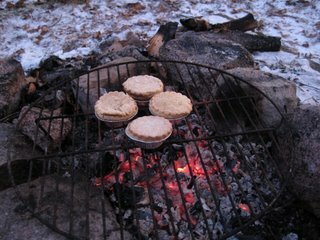 Though some mince pies warmed over the embers made a thoroughly British addition to a very non-British pastime. That photie third from top looks so foreign to any kit I’ve ever assembled for a trip! The kit is much different, but the funny thing is, that kit (which is for four people incidentally) is all you really need to go out and skate. 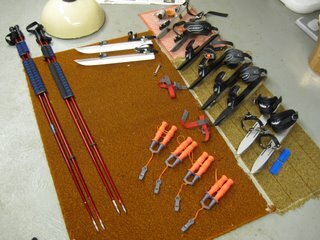 So long as you combine it with a fairly standard set of winter hill walking kit – you’re all set. Very cheap to get in to. We’ve been very comfy in Cioch (Paramo) jackets and trousers along with Buffalo mitts. The special rucksack can mostly be covered by clipping the waistbelt of a daysack between your legs (so it doesn’t float up uselessly if you take a dunking). 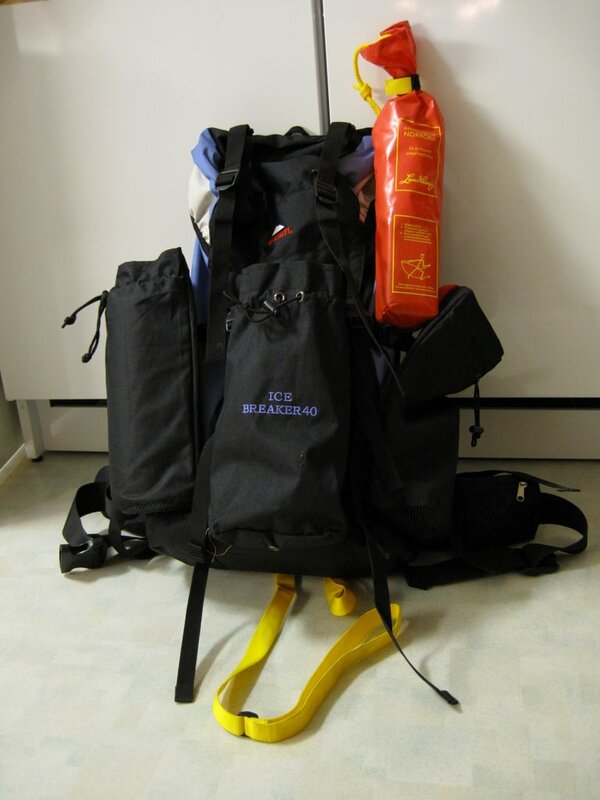 Oddly, a bigger pack is far preferable – more to keep you afloat! The only thing missing is the throw-line but not everyone carries one. With the wind in your back it is magic. Believe me, I was there…. Sounds fun. Do you cross country ski as well? Looks an amazing place to explore. If the conditions are right there’s lots of cross country skiing. There are even tracks, lit with little street lights especially. 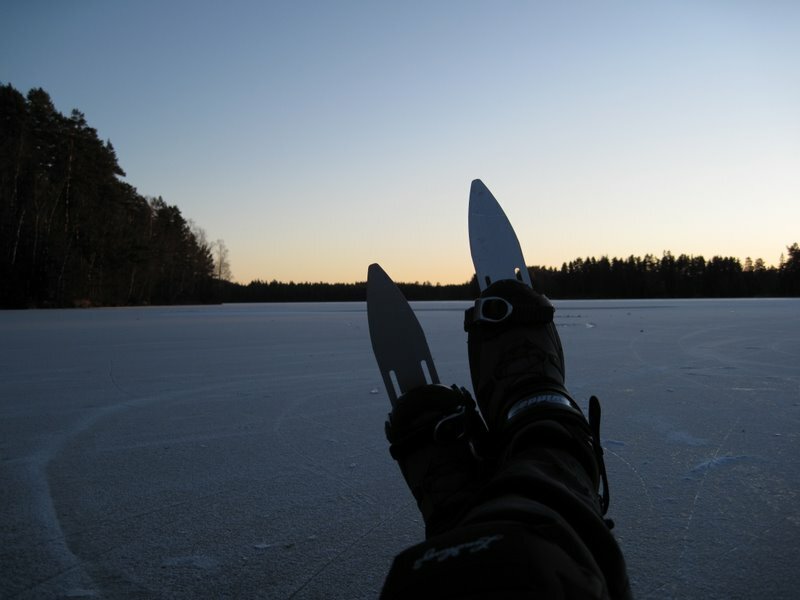 If there’s two or three centimetres of snow on the lake then everyone swaps to the skis since they’re far easier than trying to plough along on the skates. Sounds great, we were in Sweden as well, but not enough ice for skating on. You must have been further north. Personally wilderness cross country skiing has always been my favourite winter past time. We were in the Highlands (which are in the South) in and around Eksjö. Wilderness cross country sounds excellent. We’d need more snow this year of course. But there are even flakes falling in Brighton right now! Okay need to go further north we were in the northern section of Skåne. Snow in Brighton! 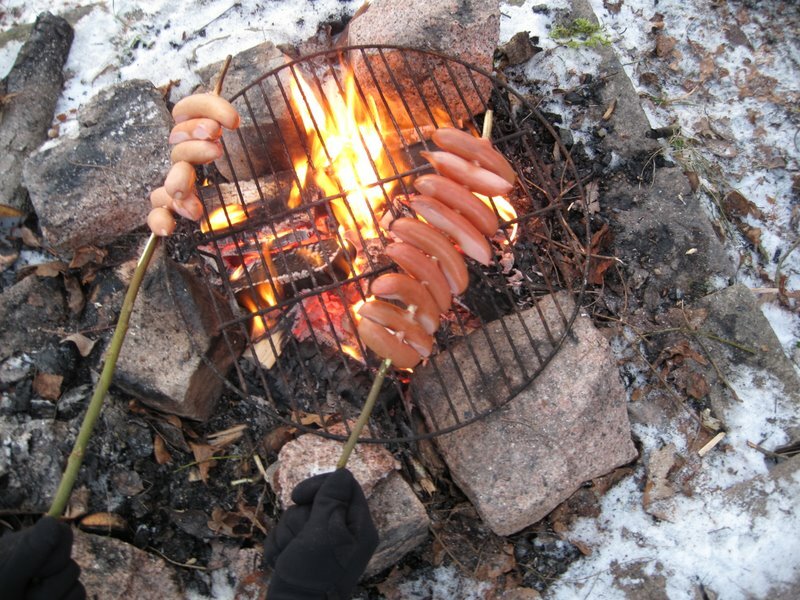 No snow here and -7 C, may get above zero Thursday they say. The lakes are frozen at the moment but ice is probably only 2 or 3 cm thick, certainly would not try skating on them. What an amazing experience. It certainly made my mouth water! Roger – -7? Nice. It touched -15 overnight in Eksjö apparently. The snow attempted some coverage here overnight but it was all gone by mid day in Brighton itself but I imagine the downs themselves retained a coating. Anj – It certainly was! We were so lucky to have the conditions just right during the time we were there. Last year there was almost no skatable conditions at all. 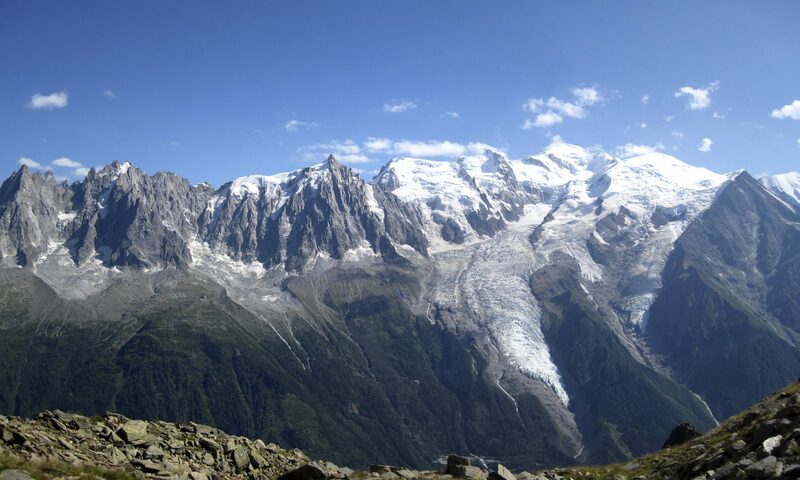 looks like great fun, will you be diverting from mountain walking to tour skating in future?? 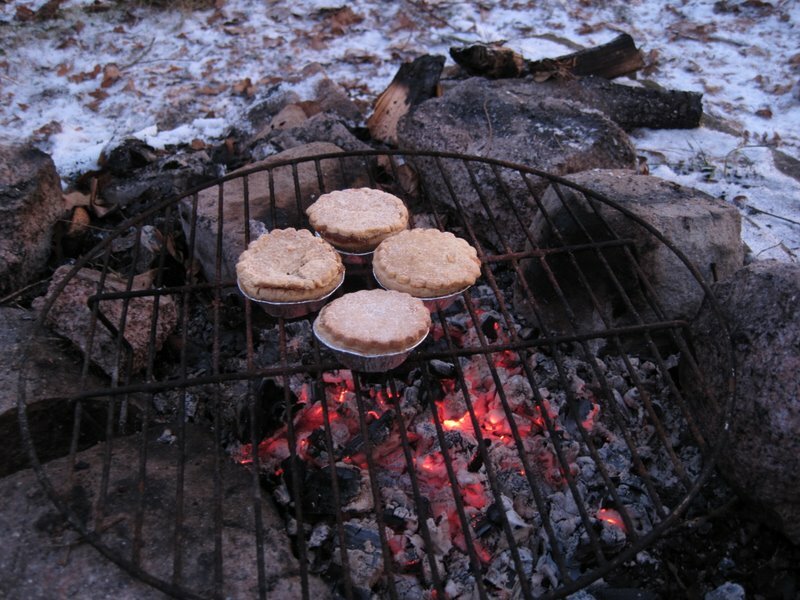 I especially like the addition of mince pies, like you said add a bit of British to a non British pastime. Richard – I’d love to be able to do more of it but even if I lived in Sweden, the conditions are rarely that good! It can fill in the blanks nicely between cross country skiing though. I hope to get out tour-skating here in Nova Scotia tommorrow. Hi again David. Yes in fact LB’s mum and dad are members of that same club. One of their best friends is the main lead. I hope you had a great days skating yesterday!